König von Frankreich (1638-1715). 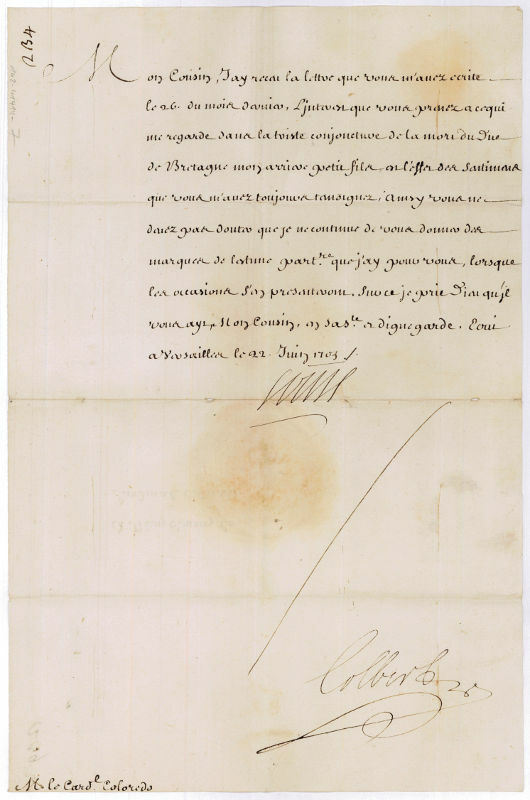 Letter signed ("Louis" in secreterial hand). Saint-Germain-en-Laye. 9 SS. auf 6 (= 3 Doppel-)Blatt. Folio. Mit Adresse. 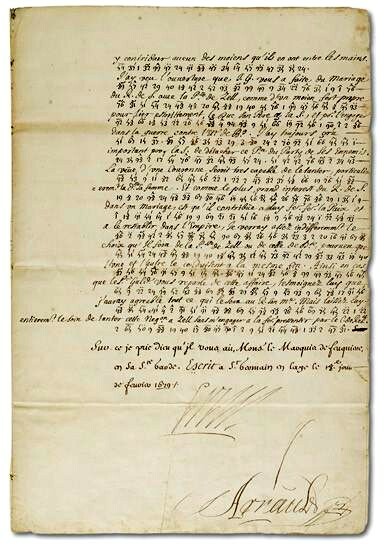 To Isaac de Pas (1618-1688), Marquis de Feuquières, French ambassador to Sweden. In French, but mostly written in secret cipher, above which the recipient has transcribed the French meaning. Louis explains that, despite appearances, France cannot continue to support Sweden due to the superior naval power of England and is unable to send a flotilla of ships in her aid. Instead, he orders movement of French land forces; he also approves the suggestion of marriage between the King of Sweden and the daughter of the Duke of Brunswick-Lüneburg: "[...] A squadron of 20 or 30 ships that I might send to Sweden's aid would be too weak to withstand the forces of England; nor is it suitable to the state of my affairs to [...] support this war by putting to sea a flotilla equal to that Crown's [...] Sweden's affairs are everywhere in such a bad state, yet she does not blame her own ill conduct. I have even learned that her ruin in Prussia is so great that it is no longer possible to negotiate for peace with them until [Sweden is] convinced of the nearly insurmountable obstacles to naval assistance that they have expected from me [...] Since the greatest interest of the King of Sweden in marriage is that it contributes to make peace and to re-establish him in the Empire, I would view somewhat indifferently the choice that he would make [...]" (transl.). - The Treaties of Nijmegen, signed in 1678 and 1679, brought an end to the Dutch Wars. Sweden was among the last of France's allies to cease hostilities, as it had tried to regain lost territories. 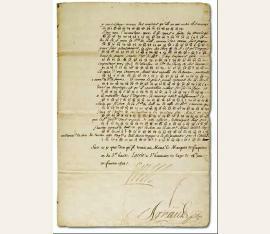 - Countersigned by secretary of state for foreign affairs Simon Arnauld de Pomponne (1618-1699). Minor scattered toning; short closed separations at folds..
King of France (1638-1715). Letter signed. Versailles. Folio. 1 p. Countersigned by foreign minister Colbert. 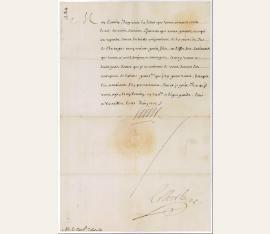 To his cousin, cardinal Colorado, thanking him for his moral support on occasion of his great-grandson's death: " Mon Cousin, Jay receu la lettre que vous m'auez ecrite le 26. du mois dernier. Linterest que vous prenez a cequi me regarde dans la triste conjoncture de la mort du duc de Bretagne mon arriere petit fils est l'offre des sentiments que vous m'auez toujours temoignez. Ainsy vous ne devez pas douter que je ne continue de vous donner des marques de lestime part[iculie]re que j'ay pour vous, lorsque les occasions s'en presenteront. […] je prie Dieu qu'il vous aye, Mon Cousin, en sa s[ain]te et digne garde. Ecrit a Versailles le 22 Juin 1703".